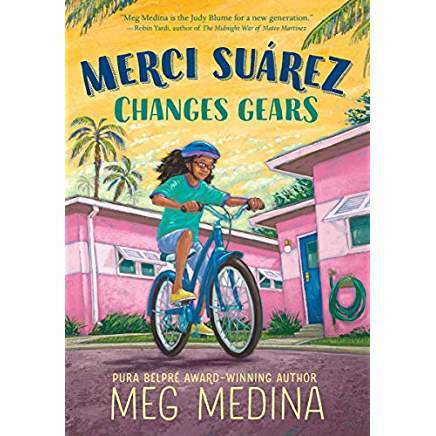 I read Merci Saurez Changes Gears by Meg Medina with an awareness of her writing commitment to the idea of both windows and mirrors for all children to see someone like themselves in books and to strengthen understanding for readers who come from a different world. She did this beautifully in her Ezra Jack Keats Award book Tia Isa Wants a Car and in her young adult books that I have read. In this new book which makes its debut September 11, the windows and mirrors seem to shapeshift as sixth-grader Merci lives wrapped both in her own family traditions and in the commonalities of middle school. As for those likenesses (mirrors), any middle schooler who has ever navigated the power play of the popular set leader will relate to many of Merci’s school challenges. Any reader who has ever had a beloved grandparent lose their mental or physical power before their eyes will grieve with Merci over her grandfather LoLo who has been her longtime pal and confidante and maybe wonder as Merci does about the time when she may have to “boss Mami and Papi as Tia is doing to Abuela.” Then there’s the common problem of children who sense something worth worrying about even while the adults in their lives are trying to shield them. The host of secondary characters are well drawn and add color to the story. I was particularly amused by Hannah’s helicopter mom who embarrassed her by wanting to know the people she was with whether it was a group party or working on a school project at the Saurez house. Meg’s mirrors and windows sparkle as though they’ve just been cleaned inside and out. Readers who are looking at themselves in the mirror or looking out the window at someone who lives life a little differently or speaks another language or two, will love Merci and her story and maybe wonder if a sequel would tell what happens next. Sign up with your email address to receive notifications when new posts are published.